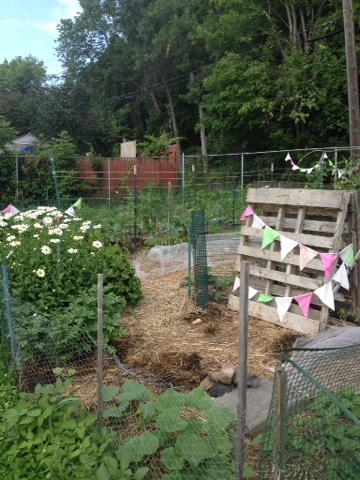 So last year around this time in my community garden, there were about six empty plots. 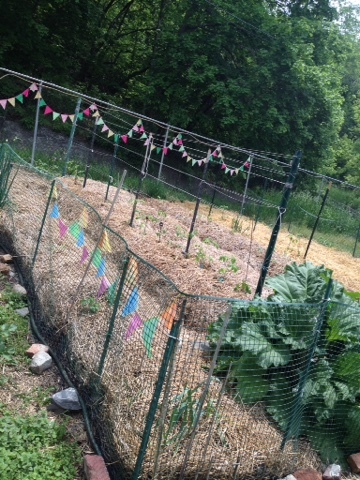 As I am always itching for more growing space and loathe weeds, I got permission to take over the plot next to mine for the season. I worked my fanny off to weed and turn over the soil and mulch it in. And then a new gardener decided she thought it should be part of her plot. Emails were exchanged and in the end, I offered to split it with this new gardener (despite having it in writing that I could use it). But then they split it weird and ugh it was annoying. 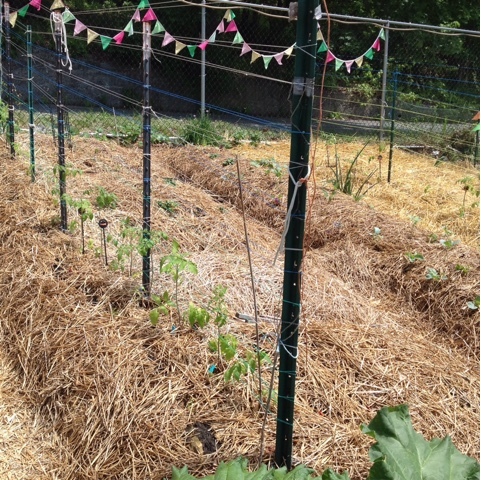 Long story short (I am skipping a whole big part of this as to not bore you to tears), I found out this year that the garden HQ just added that "bonus" plot into my plot, without even asking. I had no idea when I signed up, etc. It wasn't until about a month ago (sign up is in Feb) that I put all of that together. I was happy but shocked. So I now have, I think, the largest plot in our garden. And now you're up to date on my space. So in photos, the lighter straw section to the right is the new bonus space. 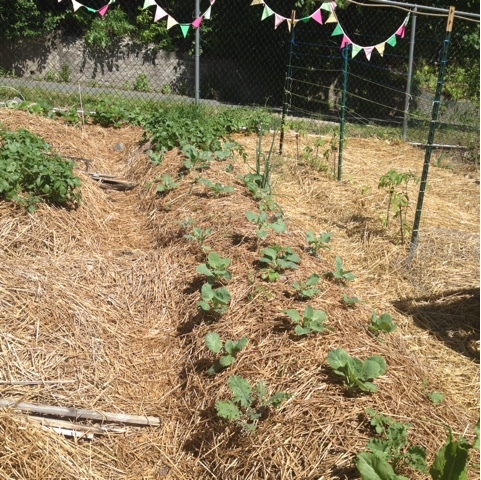 This year I will be growing a small row of tomato plants, okra, artichokes, bush beans, and the bulk of the space will be used for winter squash. The section between the old and new is a giant row of brassicas, most of which have survived the early critter nibbles. I have (if they survived), regular broccoli, purple broccoli, romanesco broccoli, cauliflower, cabbage, kale, Swiss chard, and Brussels sprouts. Last year every single one was eaten by the damn groundhog, so this year my dad has helped me completely reinforce my fence to keep him at bay. Moving to the left I have peppers (which are currently not doing well as they have been eaten by I think grasshoppers), potatoes (separate post forthcoming), peanuts (I'm glutton for punishment and trying again), summer squash, cucumbers, tomatoes, tomatillos, ground cherries, carrots, beets, parsnips, strawberries, beans, peas, leeks, garlic, flowers, herbs, and of course Ruby the Rhubarb plant that is determined to take over the world. I post almost daily on Instagram but promise to do blog updates, if nothing else, so I can keep a record from year to year. 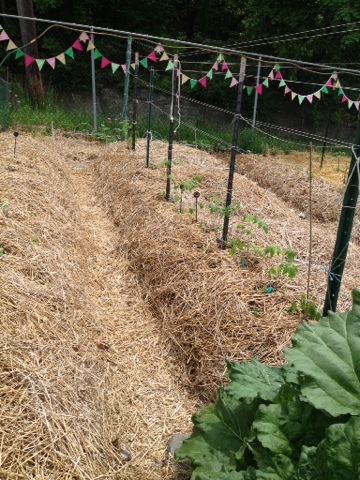 So far the strawberries are doing well and my little strawberry rocks are looking charming. Beyond that, only time will tell. But I have high hopes, as always, for a bountiful year in the garden!